Talent analytics is focused on applying statistics and technology to large sets of people in order to make better organizational and operational decisions. Much like other specific subsets of larger statistics, talent analytics uses a variety of BI tools and systems to create a more holistic and data-driven view of an organization’s staff. This way, companies can make the best decisions based on actual results and quantifiable success. Today, talent analytics is mainly used by HR departments, as it offers tools that are highly complementary to their mandate. This subset of data analytics focuses on understanding people data that can inform decisions related to hiring, retaining, or improving results of a pool of current or potential employees. The field has gained increasing importance as companies look for improvements both big and small that can streamline operations and maximize a team’s potential. Most importantly, perhaps, the field empowers HR departments and companies to increasingly quantify the aspects of managing people that can deliver the largest gains. For instance, companies could find metrics that quantify engagement, decision-making success, and even the likelihood of an employee leaving after a short period of time. Talent analytics are more than simply a way to find new policies, but rather a way to understand existing practices, find ways to improve upon them, and reinvent people practices vital to overall success. What Can I Use Talent Analytics For? There are several areas where talent analytics can be especially useful. 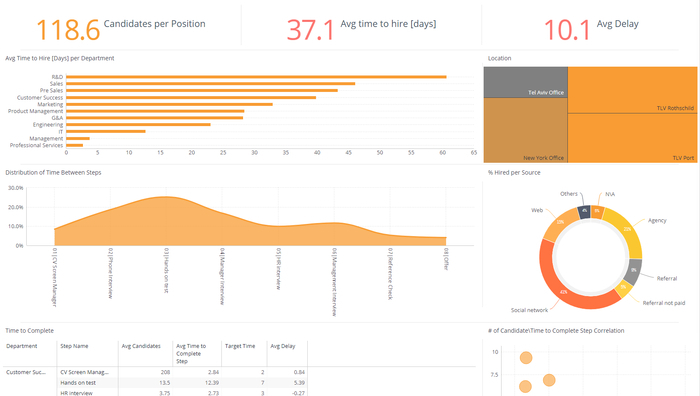 Some HR dashboards examples include employee engagement and morale along with charts correlating them with success levels and positive outcomes. In a similar vein, talent analytics can track several key employee metrics such as hours worked, salary competitiveness, earnings per employee and much more. Some organizations also utilize talent analytics to gauge potential employee attrition, focusing on characteristics and measurements of employees that may signal how likely they are to leave. This can help minimize the effects of employee turnover and reduce the impact of a team member leaving abruptly. Others utilize talent analytics in a different way. Sports teams use it to measure biometric data from athletes for a variety of purposes. This includes evaluating and delivering better care when treating injuries and health conditions, finding ways to improve player performance, and even gauging health, fitness, and satisfaction levels for contract negotiations.